Labour Rate refers to the cost of labour, usually on an hourly basis, used to derive the cost of various activities or products. In the case of a mechanical workshop, these activities are the services and repairs undertaken. If the time taken for a particular job is recorded, then the hourly rate can be applied to the time taken and the total cost accrued to the assets operating cost and ultimately whole of life cost. Fully burdened labour rate: this is the hourly cost to employ a person plus the burden of additional costs such as taxes, insurance training etc. 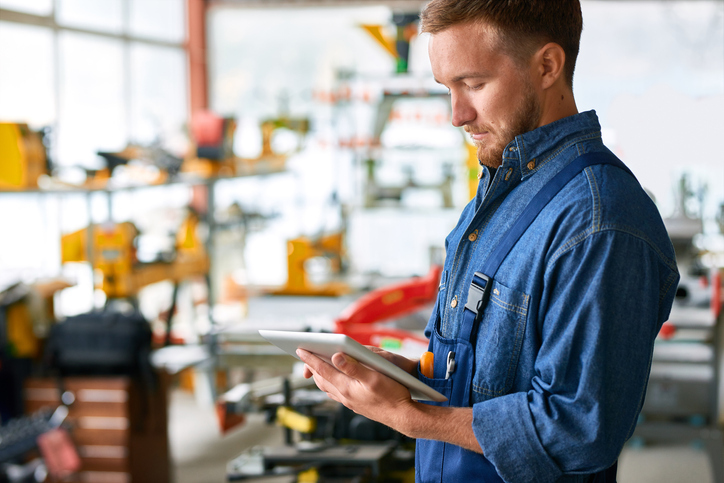 Fully absorbed labour rate: based on the absorbed cost accounting method of including all variable and fixed overhead costs in the cost of providing a service or product. Cost recovery: this again refers to the amount of money that is required to be recovered to cover the cost of employing a person including their wages and all on costs. In this article I will just refer to labour rates, but you may hear any of these terms used to describe essentially the same cost. What makes up the labour rate? The labour rate includes both direct and indirect labour costs. Direct labour costs are those costs that can be associated specifically with a cost object (in this case, the individual). Indirect labour costs are those costs that cannot be traced specifically to an individual. These costs are aggregated and treated as overheads. Vehicles – supervisors ute, breakdown van etc. The classification as direct or indirect depends on whether you can attribute the cost to an individual or you allocate a total amount across the workforce. Identify all direct and indirect costs. Divide direct costs by the available annual hours of the individual (say 1400 per annum). 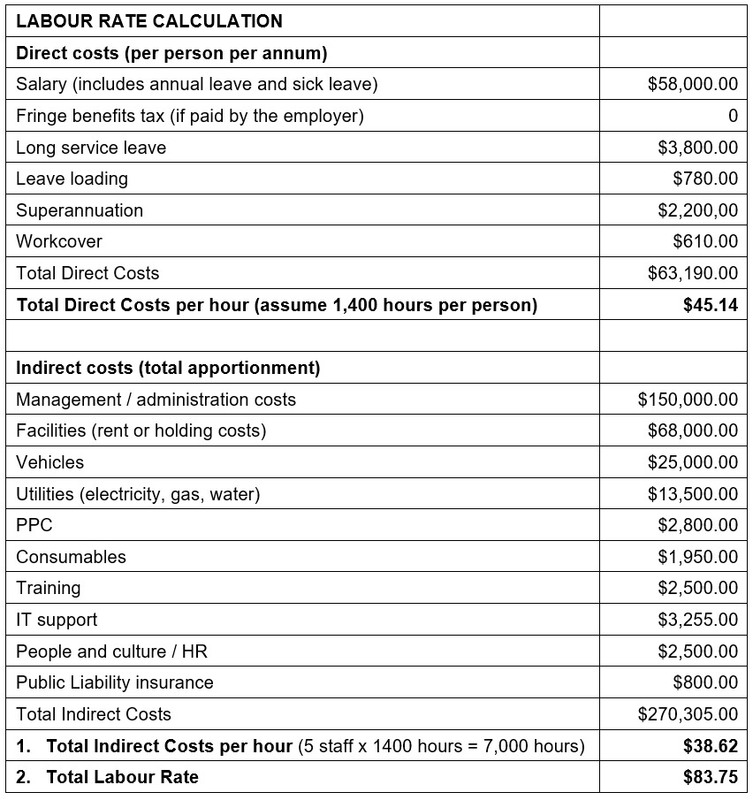 Divide indirect costs by the available hours of the total team (in the example below, five staff). Add the direct hourly rate and indirect hourly rate to get the total hourly rate. Why do we need to know our real labour rate? Attribute the cost of our workshop labour to the task being undertaken and ultimately the asset being worked on. This cost is then rolled into the maintenance and repair cost for the asset and the whole-of-life cost of the asset and total cost of operating the fleet. If we don’t include labour, we distort the operating cost of the fleet. To understand the cost of our operation and be able to use that information to understand the value and cost to the organisation. Benchmark with other organisations and understand that comparisons are on a same for same basis or if not that the differences are understood. If someone says to you, “Your hourly rate is too high, ours is $10 per hour less,” ask "Why?". The other person may not be including all cost elements or the same cost elements as you. Insource/outsource decisions need to be made with a full understanding of the costs involved. This applies equally to the outsourcing of specific tasks (for example transmission re-builds) or a full workshop operation. When full cost recovery rates are used they provide a 'theoretical' cost to deliver a service which can then be compared to an external service. This is a similar approach to making a buy/hire decision for an asset using full cost recovery internal hire rates and comparing them to commercial hire rates. Fleet managers should be actively engaged in the establishment of hourly rates and not leave it solely in the hands of the finance team. The setting of hourly rates typically occurs annually. Costs such as IT and HR support will be allocated to the workshop on a proportional basis because they are shared services across the organisation. The fleet manager needs to prepared to challenge allocations that are not in line with the actual services provided. By challenging and negotiating realistic apportioning of costs, your hourly rate will be realistic and not over-stated.